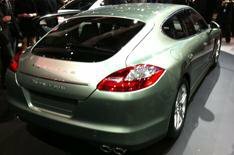 Porsche Panamera | What Car? Luxury motoring has just got that little bit more fuel efficient and cleaner with this, the 159g/km Panamera hybrid. Despite its combined 375bhp, 0-62mph time of 6.0 seconds and top speed of 168mph, the Hybrid S has emissions of just 159g/km and an average economy figure of 30.4mpg. Nudging below the 160g/km mark also means fleets can offset the price of the Panamera Hybrid S against tax at 20% per year. The car has a 329bhp 3.0-litre supercharged V6 and a 46bhp electric motor. The nickel metal hydride battery can power the car on electricity alone for around 1.25 miles at speeds of up to 53mph. It goes on sale in June, from 86,147.